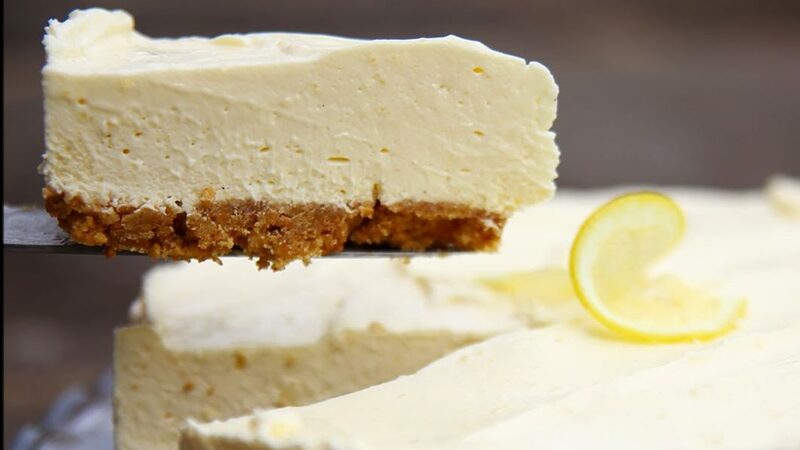 Our no-bake Limoncello cheesecake is a fabulous creamy recipe with a boozy lemon essence and crisp salty-sweet biscuit base A few splashes of this liquor really does revamp our classic recipe . Freezing extremely well this is perfect for preparing ahead of time for a party. BLEND together cream cheese, sugar + vanilla bean paste. ADD the lemon juice, lemon zest and 2 egg yolks and whisk together. MIX your crushed biscuits into the melted butter until all absorbed. PUSH into a round spring form tin and pack down to form the base of your cheesecake. CHILL the cheesecake base in the fridge. PLACE 3 tbsp boiling water into a small bowl and sprinkle gelatine over and stir until dissolved. ADD this to the cream cheese mix beating continuously so it doesn’t set. BEAT the egg whites until stiff + fold into the cream cheese mixture gently. BEAT the double cream until lightly whipped and fold into mixture along with the limoncello. POUR the cheesecake mixture over your chilled biscuit base, and spread until even. CHILL the cheesecake in fridge for at least 2-3 hours or overnight. SERVE your cheesecake - you could add some lemon zest or grated chocolate.